The recent article by Professor Steven Friedman in The Daily Vox headlined “How the incompetence of BDS-SA has promoted Zionism in SA” certainly took my breath away. No friend of Zionism, Prof Friedman’s candour and honest appraisal of the situation on the ground in SA was a huge blow to BDS. Click here to read this piece in its original form TheDailyVox.co.za or see below. “It takes special skill to turn the fight for Palestinian rights into a marginal movement in a country where the vast majority identify with victims of oppression of one identity group by another” he wrote. Worse for BDS, however, was BDS-SA’s response today which can be read here: VERBATIM FROM THE HOUSE OF HORRORS. While BDS’ profanities and theologies were certainly not called for, they are most telling of where the organisation, which has received several black eyes during this week’s Israel Apartheid Week event, finds itself. It takes special skill to turn the fight for Palestinian rights into a marginal movement in a country where the vast majority identify with victims of oppression of one identity group by another, writes STEVEN FRIEDMAN. The country is ours, where the self-importance of the solidarity movement glosses over the fact that its successes are limited to one successful, never repeated, march two years ago. The movement’s most visible face, BDS SA, seems to have largely given up on the society, focussing its efforts on an alliance with the governing party which has failed to shift foreign policy to a clearly pro-Palestinian position and has set back chances of building broad support because it excludes and alienates many people. Since BDS SA and its allies became the face of the solidarity movement, Zionist influence here has increased. While the movement sees getting ANC struggle warhorses to pile up trolleys at Woolworths and then refuse to pay as a major triumph, in the political mainstream, Zionist influence has strengthened. Yes, we do now have labelling laws which are meant to identify goods made in the West Bank and Gaza – but then so does the European Union, hardly an anti-Zionist stronghold. At the same time, the media hardly tell the Palestinian story while the Israeli ambassador boasts in private of how many good friends the Israeli state has in government. 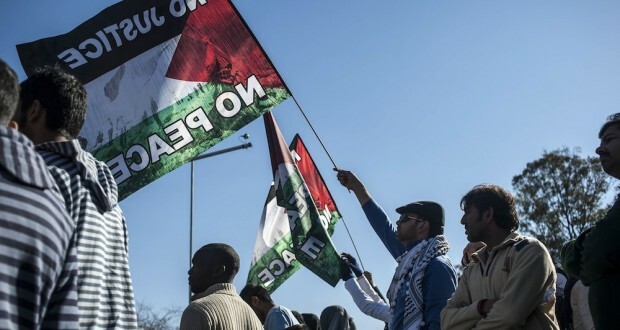 This failure to turn solidarity with Palestine into a mainstream movement here is particularly astounding when we consider that the vast majority of black South Africans are sympathetic to the cause – if the realities of Palestinian life are explained to them. There is no hard survey evidence to back this – but experience confirms it: when University of Johannesburg academics successfully campaigned for the end of UJ’s official links with Israel’s Ben-Gurion University, we received strong support in the wider society. Why this failure? In very broad terms, it is a product of a refusal to treat public opinion with respect, as something to be nurtured rather than taken for granted. But the more concrete problem is not telling the Palestinian story. If we hark back to the fight to turn world public opinion against apartheid, very little of it was about rallying people around abstract calls for one-person-one-vote. While that goal was never hidden, anti-apartheid strategists understood that, when people are asked to identify with a cause which does not affect them directly, they are far more likely to react to a concrete story of human suffering than to what seems like an abstract demand. of a day in the life of a domestic worker probably helped people make sense of the reality of today’s South Africa better than any academic paper). The solidarity movement here is interested only in abstractions. As I am writing this, the Israeli state has finally agreed to release Palestinian hunger striker Mohamed al-Kik who fasted for over three months. No thanks to the local solidarity movement who have ignored al-Kik and all other Palestinian political prisoners on hunger strike. What could be more human, more likely to instil outrage, than a person willing to starve themselves to death because they have been unjustly imprisoned? It is surely stating the obvious to say that the hunger strikes of Palestinian political prisoners are not the only issue on which the Palestinian plight could be presented as a compelling human story. Every day at 3am in Bethlehem, volunteers, including South African activists, wake to chronicle the harassment and humiliation which Palestinians experience at check points – their reports are published. But there has been no campaign here to focus attention on a form of repression which forces people simply going about their business to stand in line for three to four hours each way and to endure humiliation when they arrive at the head of the line. If solidarity work in this country focussed on the human cost of Zionism, the check points, the destruction wrought by the Separation Wall, police and army violence and political prisoners, the Palestinian struggle would take on a human form, win the support of the broad public, and stem Zionism’s influence here. The solidarity movement should know that – the only time it has organised a show of support was when people were being slaughtered in Gaza (a human story not even it could ignore). But then piling up trolleys at Woolworths for no apparent reason is easier than the real work required to run campaigns which reach people’s hearts. This is part of a special series called Apartheid 2.0, which The Daily Vox is running in partnership with Al Jazeera’s Palestine Remix.